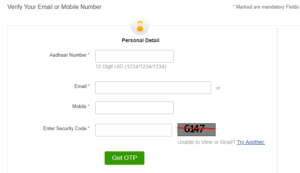 in order to link mobile number aadhar card and link email id aadhar card. Please follow the below-mentioned steps. 1 First of all, you need to go to the below mention web page as we have already provided the URL for that! 2 Enter your personal detail as Aadhaar Number, Mobile Number, and Email Address. That, you want to verify and after doing this please enter the Security Code what every they display on the screen. 3 Then click on Generate Verification Code button and wait for a verification code. You will receive a verification code on your Mobile Number and Email Address that you have requested. 4 After getting the Verification Code on your Mobile Number and Email Address. You just need to Enter the Verification Code and click on the Verify button. Doing these all four Step you are done to update the Mobile Number and Email Address with your Aadhar Card. Now you will not face difficulty in future to retrieve Aadhar Card Details.